Shark Week Blog Hop! | Primary Planet! 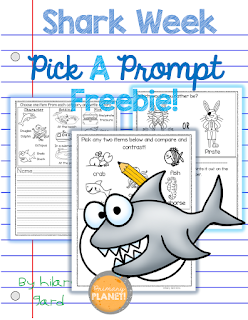 My Shark Week freebie is a few shark-themed writing prompts from my Pick a Prompt series! If you haven’t tried these out before, they are a fun way to get kiddos writing. There are three sections with pictures: Character, Setting, and Plot! The kiddos pick one (or more) from each section and write a story. There are also other types of prompts as well! If you are interested try my little freebie by clicking on the picture. Be sure to go for a swim and visit Brenda at Primary Inspired. I love the different ways that this resource will engage students. You've really included something for everyone! Thank you so much! Thanks Rachel! I hope your kiddos enjoy! Thanks so much for stopping by! I love that these use pictures as prompts! I feel like it takes away one of the burdens for struggling students, and also pushes them to think of the vocabulary that's appropriate. Plus, what a great way to offer structured choice (i.e., choice without the "I can't think of something to write about" complaints) and still encourage creativity! I'm so glad this made the newsletter. It's well-deserved for sure! Thanks for joining our hop!